Back to considering the need for solar power on Waiouru. A search on Ebay has identified a supplier of 100 watt Monocrystalline panels (1200 x 550mm) at a very reasonable price. The same company is advertising an MPPT regulator for £59.93. If I am to maximise the available sunlight the panels need to be rotated and tilted towards the sun so obviously the mounting frame needs to have this functionality. Today I experimented with Google SketchUp and produced the following drawing. The entire frame and panels collapses and folds flat onto the roof when not required. My idea is the majority of the frame can be made from 38mm box steel. The roof frame would be mounted on four rubber “engine mounts” to allow clearance for the curve in the roof. Your design works fine, while the panel support is orientated in that position with respect to the base H section. Now pivot the panel support through 45 degrees. 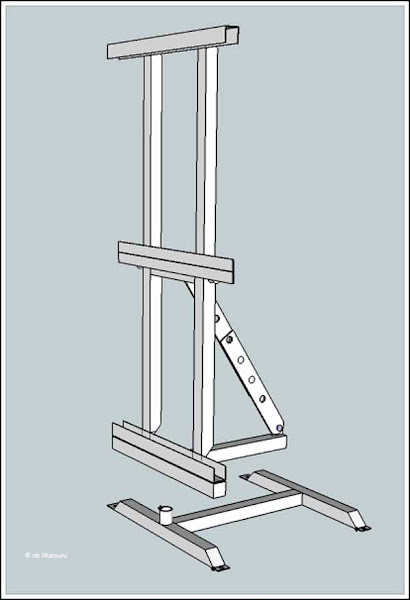 The horizontal base rail is no longer aligned with the H support, so there is no lateral support, and the horizontal tail strut, to which the adjustable brace is fitted, is hanging in mid air. To build on what you have started, I suggest you move the pivot point to the centre of the H base support, then mount a circular base plate, resting on the H support. The pivot tube will (could) poke up through the circular plate. This means that whatever direction the panel support faces the tail strut and horizontal base rail will be resting on the circular base plate, which needs to be thick enough to support the loadings when the panel support is not directly over the H section. By drilling holes through the baseplate, close to the edge, you could peg the tail strut into the hole that best suits the sun direction. Refinements, IMHO, would be to 'hide' the central pivot within the base plate and H support, and to scallop half holes in the edge of the baseplate, rather than drill holes. I think both these details would make the design look smoother, without compromising functionality. As the scallops would be at a uniform spacing the 'peg' could engage in two scallops to share the loading. Yes, I agree a turntable is another design option and it would take some of the force off the pivot point. However if I centralise the pivot in the middle of the H base support then when the panels are collapsed they will be 'off centre' to the frame and centreline of the boat which is what I'm trying to achieve. But I think I do need to give some further thought on the forces acting on the pivot point. Yeah, I think the turntable design would work better. It's much simpler IMHO. Another vote for the proposed modification. Good feedback!